﻿﻿﻿﻿Some very sad news in from Cape Town this morning, of the passing of Roger Thomas, who I managed to contact five years ago, via the blog. 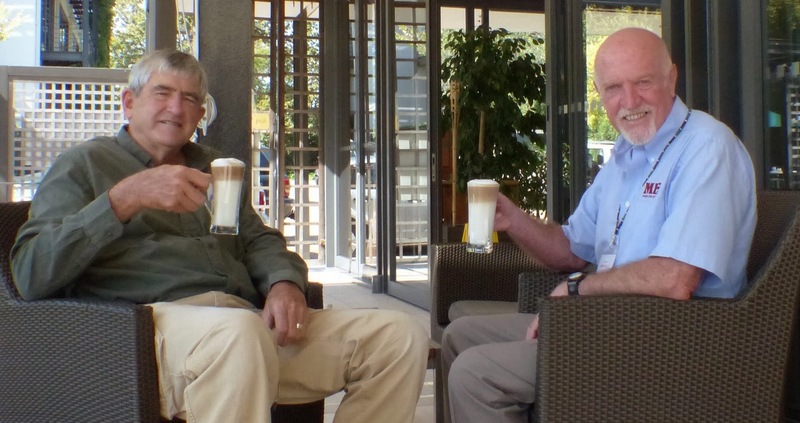 We got together for the first time in 44 years, over coffee at the Vineyard Hotel during Comminution '14. Barbara and I became great friends with Roger and his wife Janet, and we would meet up for dinner on each of our visits to Cape Town, the last time being only two months ago. Roger was acting plant metallurgist on the concentrator when I arrived in Zambia. He often reminded me of when he supervised my first duty on the concentrator- looking after the daily and monthly metallurgical accounts. I have vivid memories of Roger praising me for how quickly I produced the first monthly account, and then the next day berating me, as I had completely cocked it up, but at least I was never asked to do this again! Roger and Janet were adventurous, and they certainly made the most of their time in Zambia, travelling to East Africa (as we did), and climbing Kilimanjaro (which we did not do). They also made an overland trip to UK, driving through India and Afghanistan, something which no sane person would attempt today. Roger and Janet left Chingola in early 1971 to study for MBAs at the University of Cape Town. He then left the metallurgical profession to develop his entrepreneurial skills, first in boat building and truck hire and then in engineering supply, where he became Managing Director and then Chairman of a company supplying anticorrosive and low friction products. After retirement seven years ago Roger and Janet, and their three children, settled in Constantia, a suburb of Cape Town. After a brave battle with cancer, Roger died last night at home surrounded by his family. Our thoughts are with Janet and the family at this sad time.